What's the hot trend for the best weddings in 2017? 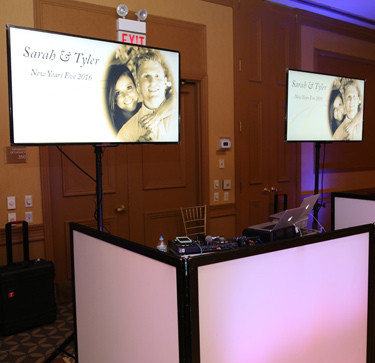 Flat Screen Video Displays allow us to create fun and memorable Video and Photo Montages. These attractive Sony 50" TVs are becoming the hottest new feature at wedding receptions. 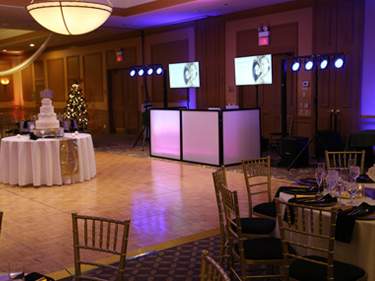 They look great behind our backlit DJ Facade, and can be clearly seen for anywhere in the largest ballrooms. Flat Screen Video Displays are available at $575.00 and include two Flat Screen Displays, Custom PhotoShop Graphic, and up to 2 Photo Montages of up 30 pictures each. Additional Video and Photo content may be included at the studio edit rate of $75.00 per hour. A standard Photo Montage of up to 50 photos is normally completed in one hour. Editing of existing video content provided by the customer likely will take more time. Give us a call at 412-373-9100 or use our easy-to-complete contact form for more information. 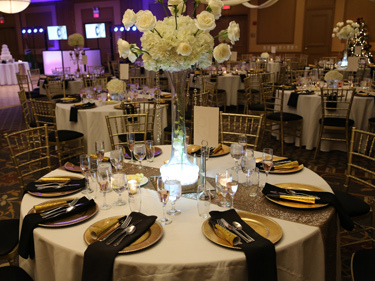 A Pittsburgh Wedding DJ provides Wedding DJ and Media Event Services throughout the Pittsburgh region, including: Greensburg, Monroeville, Pittsburgh Airport Area, Coraopolis, Moon, Pittsburgh South Hills, Upper St Clair, Mt Lebanon, Pittsburgh North Hills. Cranberry, Warrendale, Washington, PA, and Uniontown.